Last week, in a terrible parenting moment at the grocery store, I bribed my tantruming 2-year old with food. It was a moment of desperation. In my defense, though, I didn’t grab the nearest snickers bar. I would hate you to think my 7 years of studying to become a Registered Dietitian were all for nothing. No, I bribed my son with a high-end dried fruit and nut energy ball. I say high-end because I paid 2 whole dollars for something not much bigger than a walnut. Thankfully it worked a treat. My son’s screaming gave way to pleasant munching sounds as he gobbled it down. He then asked if we could buy some to take home. But being the stingy thrifty mum that I am, I refused. 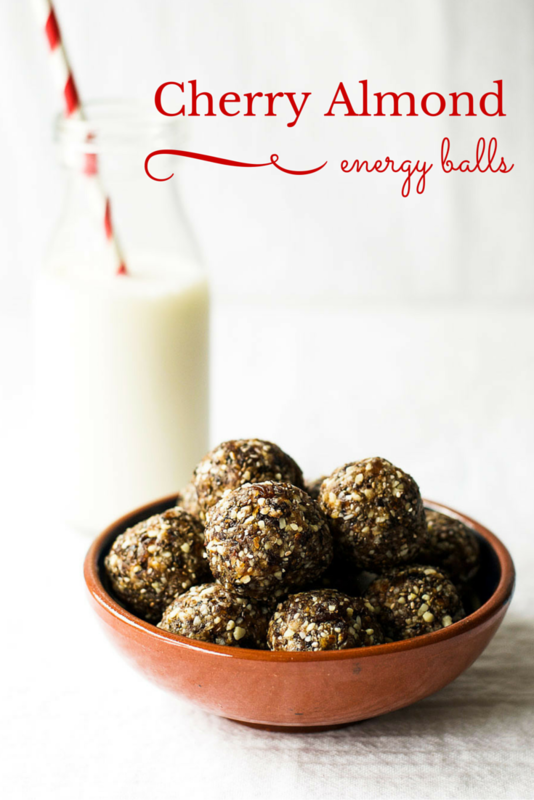 Instead, I resolved to recreate the bank-breaking energy balls at home. The result was these tasty vegan, gluten free, cherry almond energy balls that cost FAR less than $2 a piece. 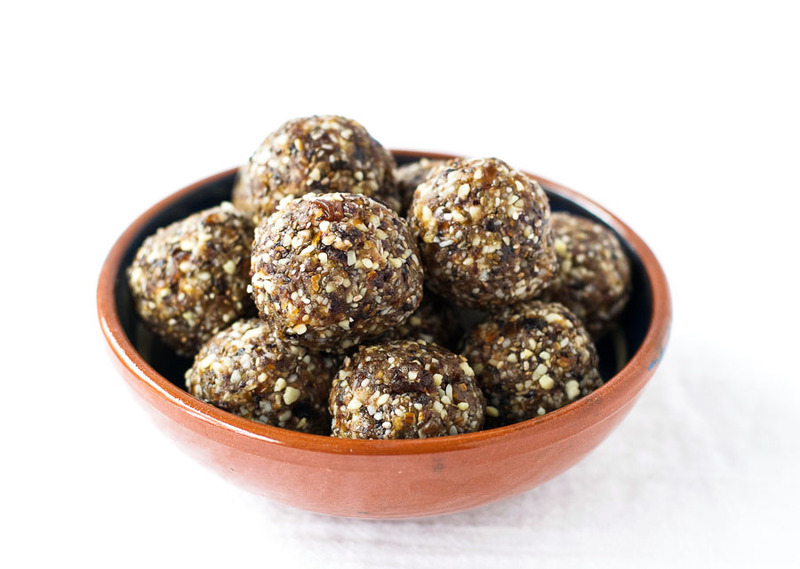 These cherry almond energy balls are made with a selection of dried fruits, nuts, unsweetened coconut, and chia seeds. They contain no added sugar, and they require no cooking. Just throw all the ingredients in a blender to chop them up, roll the mixture into balls, pop them in the fridge, then transfer them to your mouth. Easy as pie! 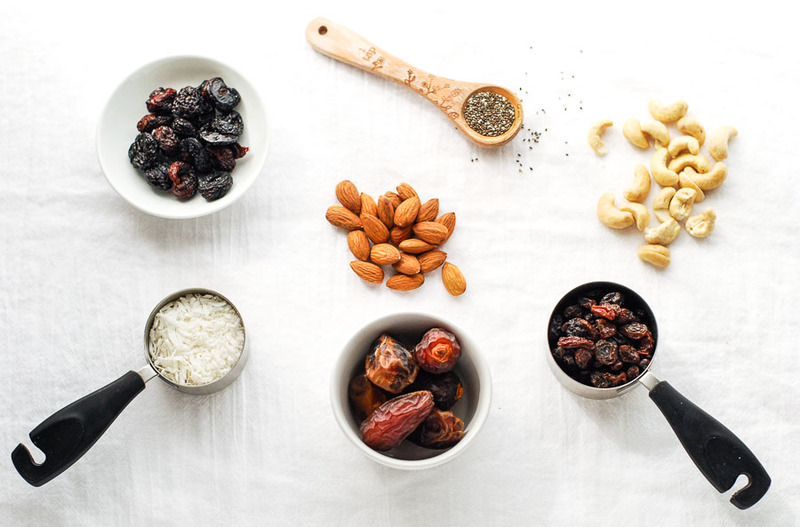 Put the almonds and cashews in a blender and pulse until roughly chopped. Add the dates and blend until roughly chopped. Add the cherries, raisins, coconut, chia seeds, and vanilla essence and blend until all ingredients are finely chopped. Form balls using 1 tablespoon of mixture for each. Remove from fridge and enjoy. Previous Post: « Is Grass-Fed Beef Healthier? It’s amazing what a two year old can get you to do! 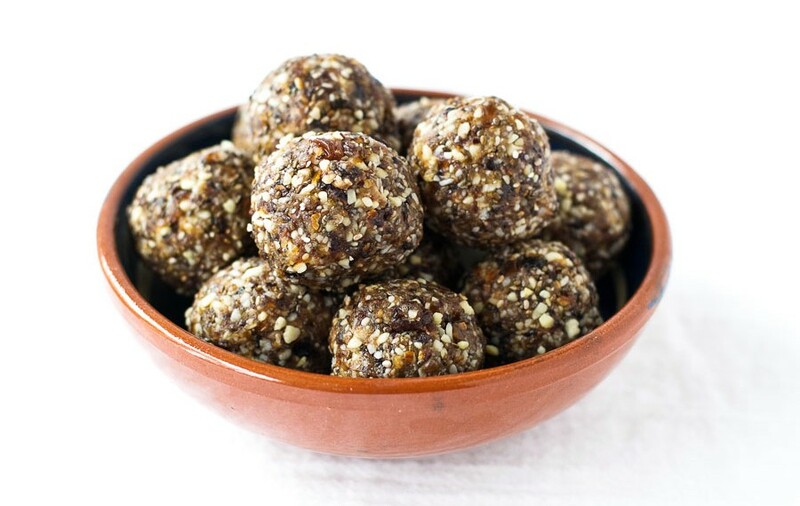 These look amazing, I love dates and adding this to my list. Thanks for sharing. Thanks Anne. And you’re right about how motivating a 2 year old can be. Especially when they are screaming in public!